Remember the 20th Century when the camera never lied? At least according to sage chroniclers of the time, Bucks Fizz. Well, this century, doctoring images is all the rage - the Daily Mirror practically makes a selling point out of it, and even the Olympic bid relied on superimpositions of giant athletes leaping over famous landmarks (Peter Crouch not being available). So we decided it was high time we had a weekly slot to showcase the best in photoshoppery. With a London twist, of course. 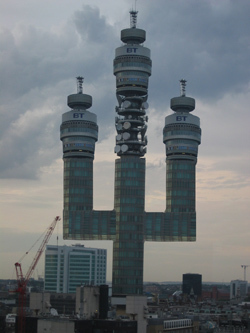 So, think you can beat our BT cactus (and let's face it, it wouldn't be hard)? We want to see your talent. Send us in your best works of Photoshoppery and we'll put our favourites up on the site. Click the Touch Up London tag below to see all entries.